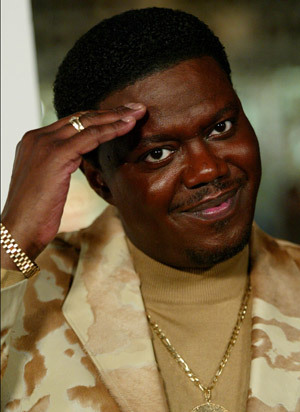 I was lucky enough to spend a lot of time with Bernie Mac. I produced and directed for three seasons on the Bernie Mac Show. Bernie wasn’t just the star, he was a host. It was his set, and he made everyone feel welcome. He spoke to every crew member, from stand-ins to guests visiting for an hour. He wasn’t always “on” but he was always funny. Nothing was more delightful than lunch time. At least once a week he had a soul food lunch catered in his large dressing room, and invited EVERYONE to get a plate. It was an amazing spread, with ox tail and ribs and lima beans and mac (heh) and cheese. He’d have a chocolate cake AND a coconut cake…and he didn’t like sweets. But he wanted folks who did to have a choice. While you ate yourself into a coma, Bernie would tell stories about his life before being a comic…tales of his childhood, of various jobs he had while developing his craft. He was so good it took me a while to realize he couldn’t have worked all those jobs. Who knows how much if any was true, but it didn’t matter. Bernie was a mesmerizing storyteller. What people didn’t understand was that Bernie was a scientist about his comedy. He was a student of the game, which is why he always invited comedy legends like Carl Reiner and Don Rickles to appear on his show. I directed that Don Rickles episode. I tried to contain my awe of the man and do my job well. After the first day of shooting, Don kissed me dead on the lips. I was flattered and horrified all at once – which is just the way he liked it. I would often ask Bernie about the state of comedy, and he explained why were not generating as many next generation great black comics. He broke down how the economics and changing of the guard were diminishing standards. It wasn’t hateration, is was a deep understanding of the Game. Years later, Bernie and I went to lunch together at the 4 Seasons. He gave me a giant compliment by saying I was one of the only people in Hollywood who understood him. That was the last time I saw him. In memory of him on his birthday (October 5th), here’s some clips from his funeral from his fellow Kings of Comedy.